The Iraqi army has started an offensive against fighters from the Islamic State (IS) jihadist group in the north of the country's Anbar province, the head of the local operation command was quoted as saying in the media on Tuesday. MOSCOW (Sputnik) — The Iraqi army was backed by airstrikes by the US-led coalition. "The units of the 16th division, Anbar police tactic regiment and anti-terror forces started a large-scale operation this morning to free the Zankoureh region to the north of Ramadi from Daesh fighters," Maj. Gen. Ismail Mahalawi, the head of Anbar Operations Command, was cited by the Alsumaria broadcaster as saying. Daesh is a terrorist group active in Syria and Iraq, which is outlawed in many countries, including Russia. 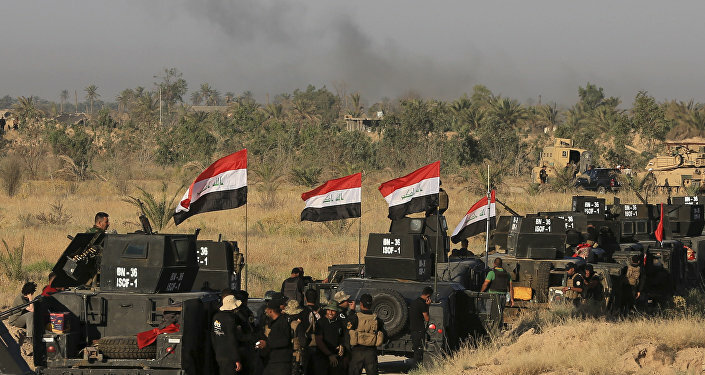 In the summer of 2015, the Iraqi army and Shiite militias, backed by US airstrikes, launched a large-scale offensive to liberate the Anbar province from the terrorists. In June 2016, Baghdad announced the liberation of Fallujah, one of the largest cities in the Anbar province, which had been a Daesh stronghold since 2014, as government forces gained control of the city center.